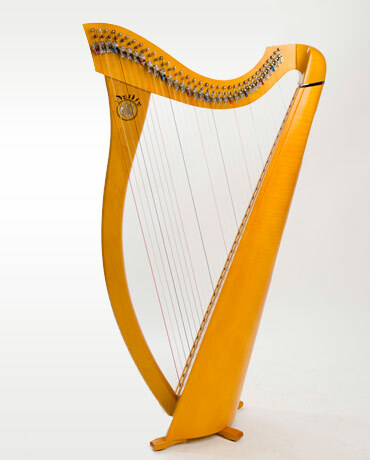 "Clarsach" is the Gaelic word for "small harp." Much smaller and more versatile than the Concert Harp, it is sometimes known as the Celtic Harp and is widely recognised as Scotland's oldest musical instrument dating from as early as the eighth and ninth centuries. Perhaps surprising to many of us nowadays, the harp was frequently carried into battle and preceded the pipes as an instrument of war. Strung with gut, it was held high on the right shoulder and plucked with the right finger. Playing the harp was also deemed a necessary attribute in cultured circles until its popularity died out in the mid 18thcentury. The clarsach is currently enjoying an exciting revival. As well as recognising its traditional role, many of today's instrumentalists and composers are pushing the boundaries way out - in terms of what this unique and very special instrument can achieve. The clarsach has an exciting future!